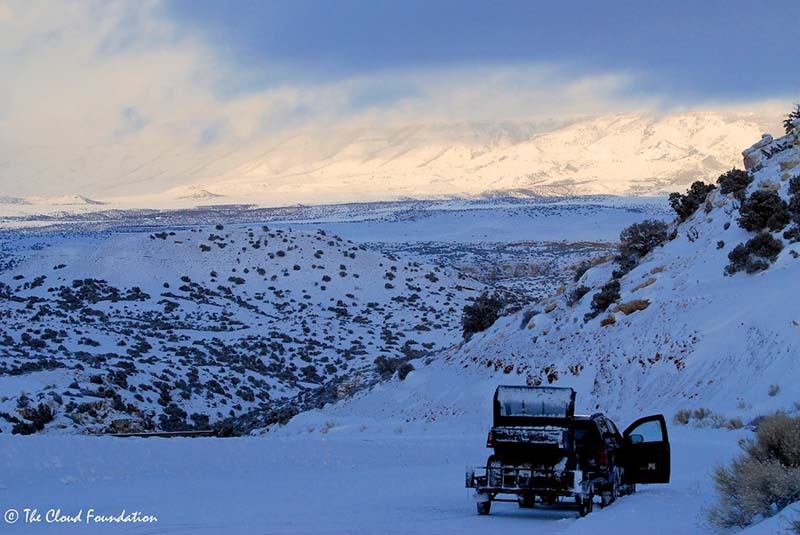 From top to bottom, the Pryor Mountains are blanketed with snow. Only the deep green junipers and multicolored cliffs break a landscape of white. 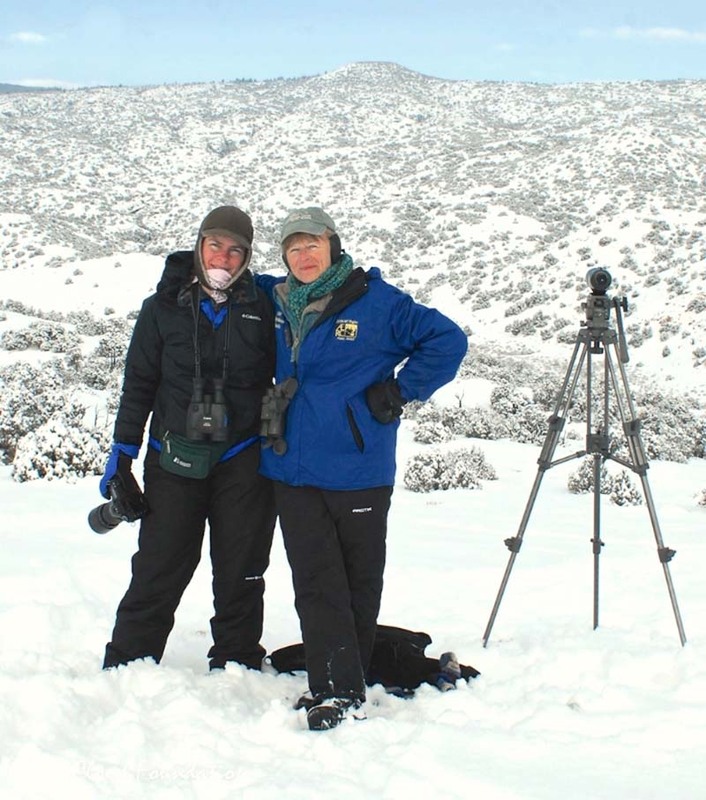 Erika Liljestrand, our newest member of the Cloud Foundation team, and photographer extraordinaire, friend and lover of all things wild, Deb Little, accompany me into the teeth of winter. For five days we search for wild horses in a forbidding yet wondrous wilderness. 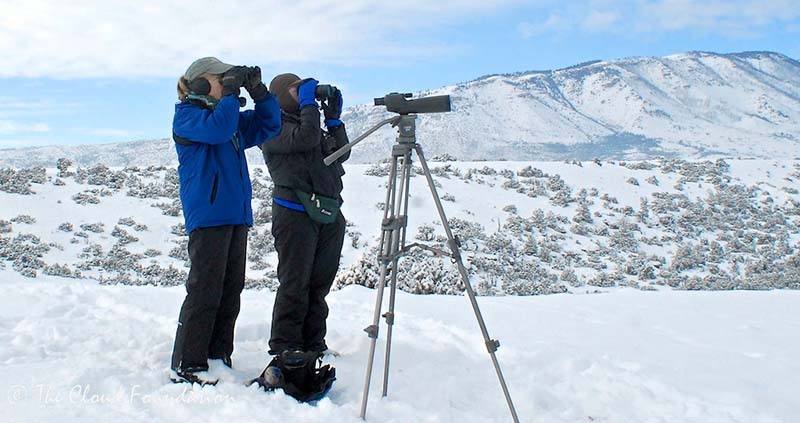 Snow is falling on day one when we spot a small group of mule deer making their way across a rocky hillside. A mule deer doe near the Bighorn Canyon. Day 1. Nearly every morning we start out early from the Horseshoe Bend Motel (our home away from home) and drive through the Dryhead on the snow packed, paved road at the very bottom of the horse range. The road follows the route of the historic Bad Pass Trail, used by Native Americans, traders, and trappers traveling from the Bighorn Basin to the Missouri River country along the rugged Bighorn Canyon. We backtrack, leaving the pavement behind as we travel to the base of Tillett Ridge, the most likely place (we think) to find Cloud and his family as well as Bolder and Echo and their band. As we load up the UTV, the snow continues to fall. Although the UTV seems able to handle the snow, its driver is having trouble. There are no tracks to follow and I can’t tell the road from the surrounding landscape, which includes steep drop offs. When I veer off the road, not once but twice, I stop. If we can’t get up the road we’re hosed. Determined to get up the mountain, Deb and Erika get out and begin walking on what they think is the road. I let them get a ways ahead and then drive toward them, hoping they really are on the road. Is the sky a bit brighter or is it wishful thinking? Are we fools? What’s the worst that can happen? After all we have warm clothes, toe and hand warmers, and, most importantly, the will to find wild horses. Eventually we make it onto a flat stretch of road and stop. The clouds are lifting a bit, allowing us to glass the area below the old uranium mines. Not seeing anything, Deb starts hiking uphill and we follow her. As we crest the ridge, horses come into view on top of the next ridgeline. Baja! I recognize the stout little dun stallion with the two-toned mane and tail. His three mares are there, including the youngest member of the Pryor herd. Washakie gave birth in the fall—not a good time of the year to have a foal. Despite his ill-timed birth, the little colt looks fine to us. He is stout like his parents, and has a beautiful two-toned mane and tail like his father. As we turn to look behind us, we identify Casper with his large band including Cloud’s sister, Mariah, as well as Aztec and her daughter, Jasmine. I wonder if Aztec will ever return to Cloud? And, more importantly, where is Cloud? Is he all right and and does he still have his band? As I have for his entire life, I begin to worry. To the right of the mines, Deb spots horses and we set up our scopes again. We can see Cloud’s mother, so we believe we are looking at Diamond’s band. We assume the dark horse is Diamond as his coat can turn quite dark in winter, like many of the Pryor blue roans. We drive on, struggling up the long red hill. We lose sight of Phoenix, and hike the road to the west of the mines where we glass out into the Hell ‘n Gone. I had seen Bolder far out in this inaccessible area at the end of December. Hightail disappears in the greasewood. This time, we spot only two horses and I recognize the light dun roan bachelor, Knight, from miles away, with a bigger, dark horse, likely Inali or another one of the big Forest Service boys. I’m disappointed not to see Duke’s big band or Gringo’s band or He Who with Cloud’s stunning buckskin daughter, Jewel. Is Chance still dogging Gringo, trying to win back his family? I wonder silently. His loyalty is to be admired. At the end of day one when the light is failing, we head to the Dryhead for a second time. Crossing over the cattle guard into the range we are rewarded with a look at the “greeters at the gate”---handsome Hickock with his mares, Hightail and Seneca. In a matter of seconds, they disappear into the willows, tall sage and greasewood. Day 2. 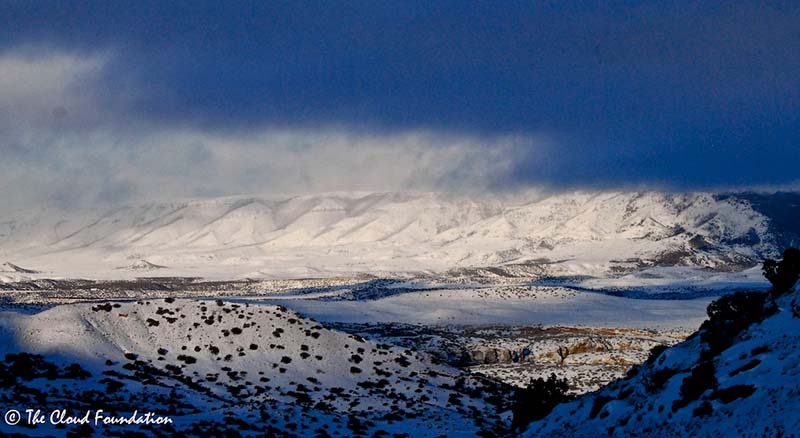 Overnight it snows in Lovell and low clouds obscure the Bighorns to the east and the Pryors in front of us. In the Dryhead, near the road, we spot the grullo stallion Fiero with the mare Sacajawea. The two disappear over the hill and we follow, and are lucky to get a few shots off before the pair walk downhill through the dense, snow-covered junipers. Near the Devil’s Canyon Overlook four Bighorn sheep are foraging on mountain mahogany bushes, a critical winter food for both mule deer and the bighorns. It is the two ewes and their lambs that I have seen since they were tiny last summer. How will I recognize you two when you are grown? Adult ewes all look so much alike to me. Beyond the ewes and lambs, on a rocky hillside, we spot a young, half curl ram. I believe he is the son of one of the ewes. As we drive back to the main road, he crosses, dashing effortlessly up a snowy slope as if he had wings. What is likely Hernando (left) behind Missoula, Half Moon, and Phoenix. We head back to the base of Tillett—again. Thank goodness the snow hasn’t completely covered our tracks from yesterday! Close to where we spotted Baja we see them again near Doc and his little family. Higher up we see Phoenix again with the band. I can see War Bonnet, Half Moon and her striking red son, Missoula. But the dark horse with them looks too dark and too big to be Diamond. Does the dark horse have a back boot? I ask Deb and Erika. Diamond has a back white boot, but they confirm that the stallion has no leg markings. He does have a big star but it isn’t shaped like Diamond’s. 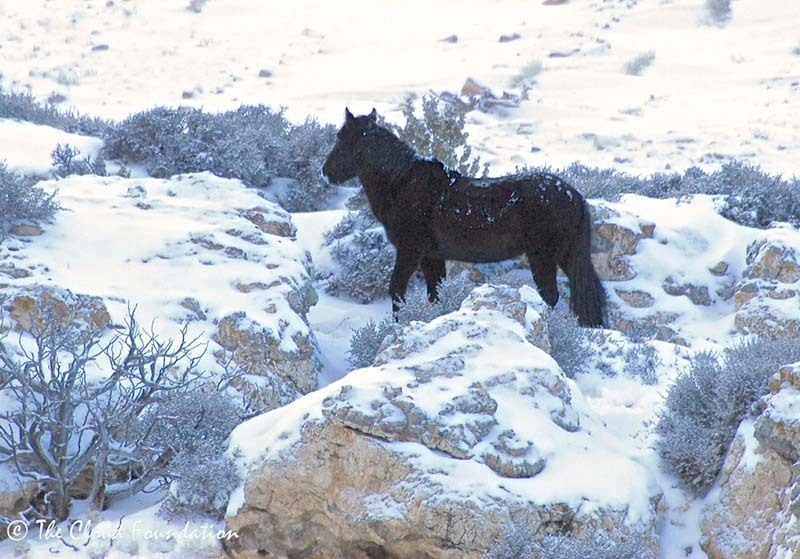 We think it is Hernando, the son of Conquistador and Cavalitta, and the tallest horse in the Pryor Mountains. My heart drops to think that Diamond, at nearly 20 years of age, has lost his family. Is he alive? Or injured? I wonder out loud. During the course of our five-day adventure, we get our answer. 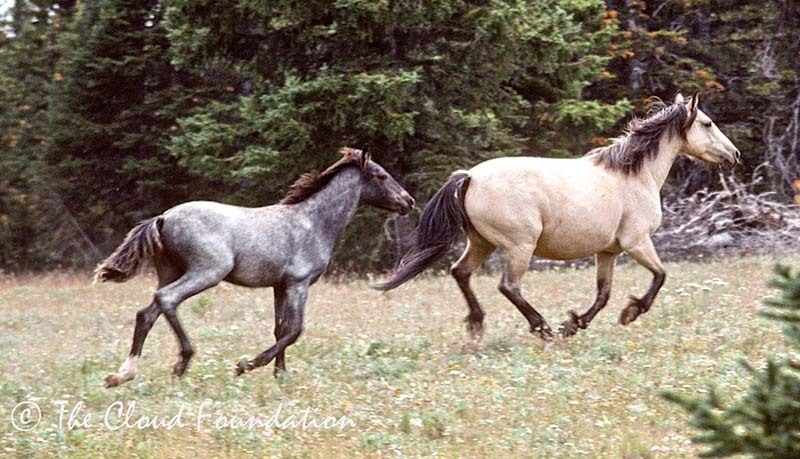 Diamond, as a colt, runs with Isabella in September, 1994 after a roundup in which his two brothers were killed. Diamond was the first wild horse foal I ever saw. He was only three days old in March of 1994. He and his family, including his striking father, Raven ran away from me in the red desert county at the base of Tillett Ridge. It was an unforgettable moment and, as I would eventually learn, a life-changing one. In retrospect, I don’t believe that I would have gone back out to the Pryor Range after an uneventful, one day tour of the Dryhead with local advocate, Reverend Floyd Schweiger. But when the Reverend mentioned that there was a newborn on the range, I knew I had to go look for the foal. Without the desire to see the newborn, I would not have met Raven and his band at dawn the next morning, and, most likely, I would not have chosen the Pryors as a filming location for my Wild America film about mustangs. But, I did meet charismatic Raven and I did find the newborn that I named Diamond for his big star. As they raced away, I vowed I would come back. Now, nearly 20 years later, I am standing on this stark, white landscape and wondering, Where are you dear Diamond? The view is exceptional. It has cleared enough to see details and we begin glassing the far ridges below us, near the precipitous edge of Big Coulee. A pale horse! Two pale horses!!! It is Diamond’s little brother, Cloud with Encore and the family. In Deb’s picture, can you see Cloud far out in the center of the frame and to his right is Ingrid then Mato Ska and to the far right, Feldspar with Encore laying in the snow? What a relief to see them! As the sun is setting we begin driving downhill, but something is wrong with the UTV. It loses power and starts to back fire. Nothing during our trip was as scary for me as this. If we stall out, the walk down will take hours in the dark, and how much of our photography equipment can we realistically carry? I floor the UTV and it picks up speed, only to sputter, lose power and back fire again and again. We are holding our breaths going down, but down we go and make it to the Durango at the base of the mountain. Dodged a bullet! The next morning, after we get the UTV fixed, we head out to the bottom of Sykes Ridge. The road is a series of drifts as a result of high winds the night before. Undaunted, we plunge into one drift after another at full speed. It is a wild ride. At the Red Buttes we stop to glass, successfully identifying some of the distant dots as Fool’s Crow and Hidalgo’s bands and Jasper, the bachelor son of Flint. Even from afar I can see the lovely mark on his handsome face.There are other dots that will forever remain anonymous because when we try to drive closer we become hopelessly mired in a two-foot deep, 20 foot long drift. After getting lots of exercise shoveling, we retreat back to Tillet. On our way we stop to glass and identify Jackson’s band in the hills just above Turkey Flat to the right of the mouth of Big Coulee. And we’re excited to see Bolder and his family, including Echo following his mother, traveling uphill on the east side of Big Coulee. To Bolder’s left and higher we see Bristol, Kitalpha, and little Nova. The filly foal is the only red dun on the Pryors. She inherited her striking color from her grandfather, Lancelot. To their left we can see Cloud again. From this perspective they appear to be in a different place but one that looks equally inaccessible. We head up Tillett Ridge again, hoping that there might be horses close enough to the road to observe and photograph. Hoping doesn’t make it so. We see no horses although we glass until sunset. Baja's foal and Topper Two trotting away. We formulate our strategy before starting up Tillett yet again. At the new water catchment on Tillett we find Baja’s band moving quickly up hill. Then we unpack our key pieces of equipment and set out on a hike to the highest hill above Big Coulee. Walking in the dense snow is not easy and we each fall at least once before reaching our rocky mountaintop perch. The scenery is breathtaking, and to the east we begin to see bands that had eluded us from other vantage points, like Red Raven and Flint’s families. And near Big Coulee, we see Cloud and his family again. From afar they all look fine. Diamond, below us and far to our left, is foraging all alone. Diamond, War Bonnet (my Trace's mother), Phoenix, Missoula, and Half Moon run just for the fun of it last summer. Over our shoulder and below us is Mescalero with Polaris and Rosarita and beyond them Casper and his band. But Deb was to make the very best discovery of all. To our left and down toward the canyon was Diamond! He is alive! Through our scopes we can see he is thin but has no visible wounds or lameness. How he will fare alone without Phoenix and the rest of his family remains to be seen. I hope he might pair up with another bachelor, perhaps Sante Fe who is only one year younger. I always worry when a former band stallion isolates himself. “Don’t lose heart my boy”, I whisper. After sunset we make our way to the Dryhead and spot the bachelors, Issaquah with the striped up grullo, Hidatsa. It is dark as we drive back to the Horseshoe Bend Motel. Kemmerer walks over a ridge. We travel out to the Dryhead where we spot the bachelors, Kemmerer and Chief Joseph. Knowing that we have little chance to access the Pryor bands, we decide to make a run over to the McCullough Peaks east of Cody, only a 45 minute drive from Lovell. The colorful Peaks horses are as easy to see as the Pryor mustangs are hard. A multi-band group of 16 mustangs are foraging near a gravel pit and we are able to take those close-up pictures we had hoped for in the Pryors. Within a couple of hours, the horses streamed off their hilltop and we can stand right off the paved highway and take pictures. Deb leaves us to continue her journey, while Erika and I start the long drive back to Colorado. But we just have to have one more wild horse "fix". Let’s take a run out to the Dryhead, I suggest. We are rewarded with our best views of a large group of mule deer does and fawns. 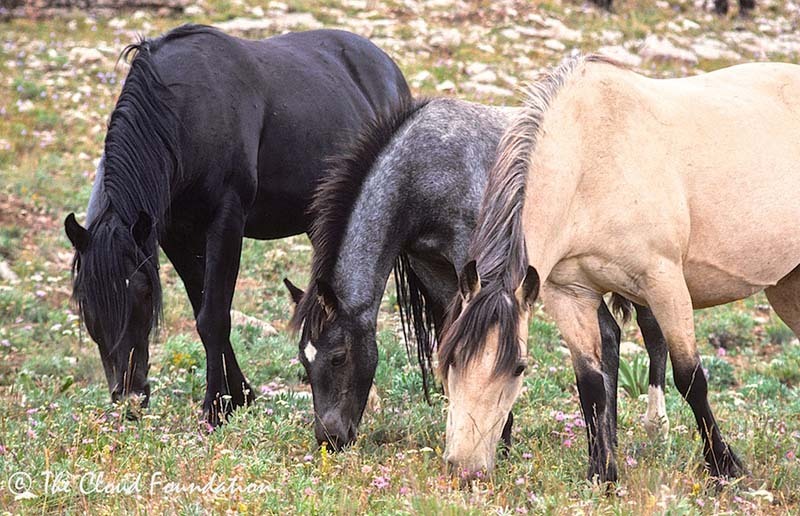 From the Devil’s Canyon overlook, we spot Corona with his son Norte and mare Waif, but we don’t see his oldest mare, Topper, the most striped up horse on the Pryor Mountains. I like to think she is fine. She is probably just over the hill. Cloud, Mato Ska and Encore in late December 2013. There is plenty of time to think on our nine hour drive home. With Diamond’s fall from the ranks of a band stallion, Cloud becomes the oldest male to lead a band. How can the years have passed so quickly? 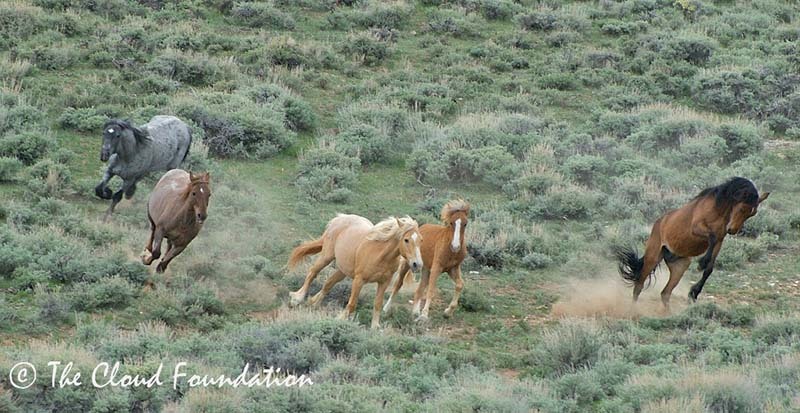 Many thanks for your continuing support of our efforts to keep our precious mustangs families in their wild homes where they are the safest and the happiest. P.S. This may be the most difficult journey I have ever taken into the Pryors. Weather made travel almost impossible. We have encouraged the BLM to open the gate into the Administrative Pastures for the horses during this very difficult winter season. We will let you know if they decide to allow them to access this lowest area of their mountain home. It is where my journey with wild horses began nearly 20 years ago—where my sister, Marian, and I had that brief encounter with little Diamond, his father, Raven, and their family as the sun was cresting the Bighorn Mountains.